Art and Photography : All Art & Photography Photo Gallery Templates are designed with photographers, art dealers, galleries, and artist portfolios in mind. If you are an artist or a photographer, template 36323 will help represent you artistically! Dynamic flash photo gallery: Our Dynamic Flash Gallery is by far the most brilliant solution for arranging a gallery section on your website. Incredibly easy to install and extremely simple to maintain, template 36323 is a truly splendid system for modifying a gallery content - texts and images - through an admin panel or through an ordinary .TXT file. This system has lots of additional options included - adding comments to the images, setting preview details (width, height, spacing etc.). 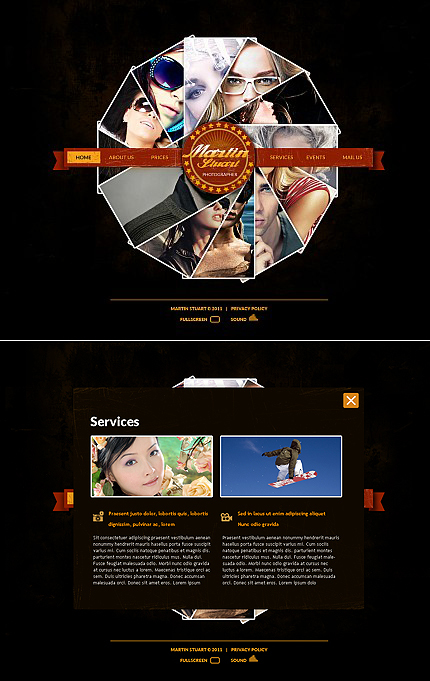 Flash Site : Template 36323 is a complete website designed entirely using the flash technology. The template takes advantage of the latest available technologies in flash website development. Visitors will be inspired by the interactive interface of this flash website design. (Note: You get the complete html version of the design in addition to the flash website). Xml Flash : Template 36323 is a Flash xml Site template and uses the technology that will allow you to edit your Flash website from a simple XML file. This new technology gives you the opportunity to add as many read-more-links as you wish. Another feature is that you can now switch the menu items and they will automatically be followed by the proper page switches. You can also make the text available for copying by simply changing one setting in the XML file. Bonus with every purchase With each template purchase you get Free Web Design Elements: photos, fonts, icons, 3d models, sounds. Buy template 36323 from zeronese today and get access to the Free Clipart & Free Web Design Elements library.